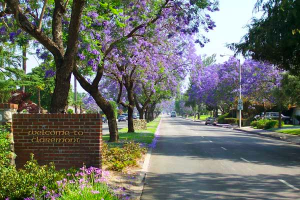 I grew up in Claremont California, a town often called the “City of Trees and Ph.D.s” for its well-known colleges and graduate schools and the matching tree species that lined the streets, including my favorite, the periwinkle-blossomed Jacaranda. After high school, I moved to the east coast for college and graduate school, on campuses with buildings and foliage reminiscent of my hometown. 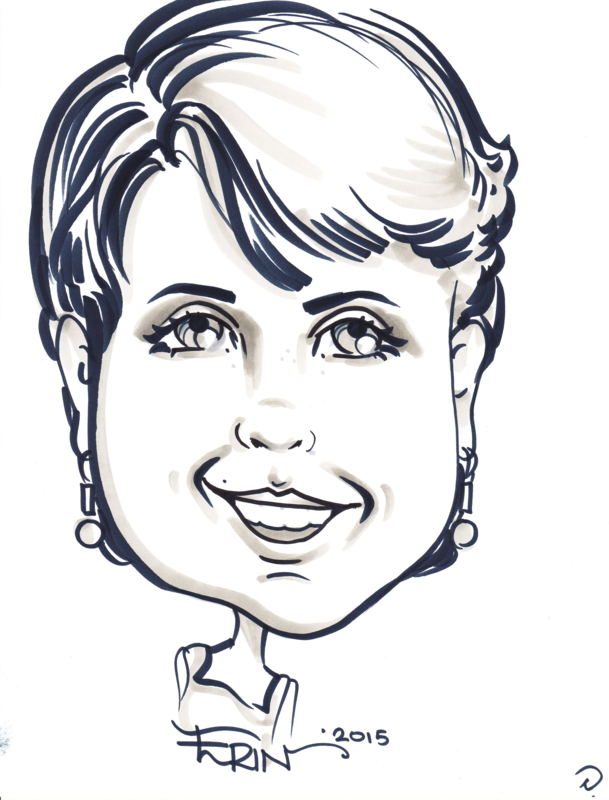 Eventually I landed in Williamsburg, Virginia, pursuing my editing career and training to teach yoga classes on the side. Ten years on, I was a married mother of a twelve-month-old baby boy. 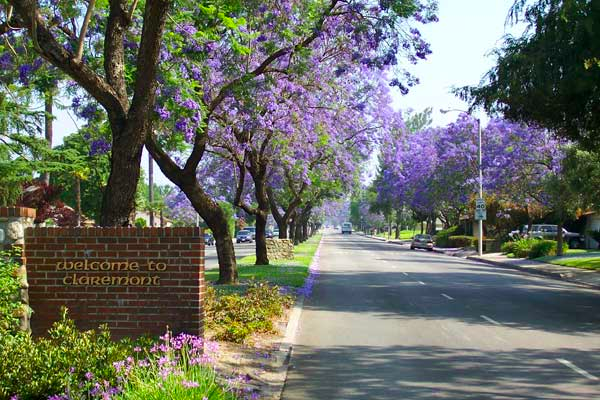 I was settled in my career and the very best nest, but in spring 2011, something out of my control lured me back to my lifelong friends in Claremont. I had always known the town was filled with academe, but my recent leukemia diagnosis soon opened my eyes to a different type of learning: I needed to learn the real meaning of kindness. One day about a year after my diagnosis, when I was feeling tight and uncomfortable in my own body from the lingering side effects of treatments, I wandered into Mint Leaf Thai Massage near Claremont’s railroad depot. I asked the lovely woman at the front-desk for a gentle massage. The petite Thai woman, my mother’s age, stood up and beckoned me to her massage room. When I pointed out the port protruding under my collarbone beneath my skin, she knew all about the tough road of chemotherapy because she had gone through breast cancer. She gave gentle, thoughtful massages that would lengthen my tight muscles. After several monthly visits, she insisted I come to her twice a month. When I explained I did not have the budget for so many massages, she offered to give me free massages until I felt better. And she did. Her kindness gave me a safe place to face my changed body after enduring chemotherapy, radiation, and a stem-cell transplant. Often, I would be crying with relief by the end of a session, thanking her for her caring touch. I began taking classes at Claremont Yoga in summer 2012. Out of shape and with “chemo brain,” I quietly introduced myself to each teacher, explaining my circumstances. The teachers took me under their collective wing, adapting and accommodating poses I could not do because of my port or lack of flexibility or stamina. Other students in classes came to know me, my son, and at least some of my leukemia journey. At Claremont Yoga, where the teachers and students support me with encouraging words, I’ve been able to laugh at moments when I blank on a pose or name. From my hometown yoga community, I’ve come to embrace the light, joy, and kindness that yoga has brought to my life. Down the street from Claremont Yoga in the Village is a store full of singing bowls, fountains, incense, gongs, flags, books, figurines, and all types of jewelry. Called Buddhamouse Emporium, the shop intrigued me. At first I would visit for heat relief in the form of air conditioning. Soon, I came to know shop owner Charlotte. During our wide-ranging conversations surrounded by art on the walls by local artists, she and I would talk of gratitude and generosity. She encouraged me to put together strands of what I called Pranayama Beads, with each string of beads following a breath pattern. 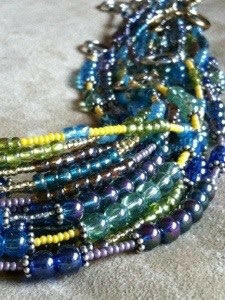 I showed her several, and she liked them so much she wanted to sell them in her shop. It was a creative endeavor that I never would have pursued without Charlotte’s friendship. In summer 2013, I followed another passion all the way to a writers’ workshop. Filled with creative people as enamored of the written word as I am, these folks have helped unlock my creative writing juices. Though I had written short professional pieces before, I had never followed my writing passion on a more personal level. In the workshop, I shared essays about the harrowing first year of my leukemia journey with the group. Members gave not only constructive criticism but also encouraging words, hugs, and chocolate. Their feedback on my work always left me feeling strong and courageous about my writing life. For the cost of admission—photocopies and a dollar or two donation per session—I’ve been buoyed by a camaraderie I had missed from my publishing days. Today, I’m a die-hard Claremonter. My son and I visit with longtime gal pals and their families. I am teaching in a limited capacity at Claremont Yoga. And next month, I will give a reading from my newly self-published book at Buddhamouse. I’m also embracing a whole new community of intellectually engaged parents at the elementary school where my son just started kindergarten. Like my son, who is progressing from a toddling preschooler to a more independent youngster, I am moving beyond my cancer identity, transforming into something better and kinder. Just as this village will help raise up my son, I’ve learned that it takes a village to heal a person physically and spiritually. I’m grateful to all who have taught and loved me along the way. “New Lessons From My Hometown” is by Erin Michaela Sweeney. In February 2011, Erin was diagnosed with ALL (Acute Lymphoblastic Leukemia), a rare and aggressive blood cancer. This story is an adapted excerpt from her self-published memoir: Every Breath Is a Gift: Reflections on My Leukemia Journey, which she is releasing in September to coincide with National Leukemia and Lymphoma Awareness month. Erin is now a writer, mommy, yogini, daughter, editor, sister, and napper extraordinaire who lives in Claremont, California. For more information about her memoir, visit www.ErinMichaelaSweeney.com . Photo credits: Welcome to Claremont courtesy of the Southern California Violin Makers Workshop; Pranayama Beads and author profile image, courtesy of the author. This entry was posted in Guest, Learning & Place and tagged academia, California, cancer, chemotherapy, Claremont, encouragement, healing, hometown, kindness, leukemia, massage, parenting, stem-cell transplant, Virginia, writing, yoga. Bookmark the permalink.